The practice of Yoga, while it works to mature the mind, can also reveal the mind as a young, persistent child. Just like the other day, when I saw a mother walk out of the store. She prompted her young son to follow alongside of her, and he confidently demanded to know, “Why?”. Our curious minds create endless questions in attempt to figure out the practice. For some of us, it is “how?”: How do I do that crazy pretzel pose? How will I ever find balance on one foot? How can I watch my breath without changing it? And how will I know if I’m doing any of this correctly? There’s also the clever question of “Why?”: Why practice yoga at all? Why practice these specific poses? Why practice with a teacher? Why point my toe vs. flex my foot? Why inhale for up dog, exhale for down dog? In case I haven’t already, you could easily drive yourself (or someone else) crazy with the endlessness of why. Lately, I’ve been attempting to let go of 99% of the “why” questions, and instead, focus on one, intrinsic “why” that drives and sustains my practice. While uncomfortable at times, I become more inspired to learn from the practice when I let go of the questions and enjoy the time that I have to move, and to breathe! In my experience, we do not really need the answers to most of our questions. We do not need to complicate our practice. Rather, our practice and our presence intensifies when our efforts become direct, focused, and clear. Challenge yourself to commit to one motivation for your practice; a motivation that is personal, passionate, and sustainable (avoid numerical goals or reward-based motivations). Seek out an idea that inspires you on a deeper level; it may be the desire to learn something new, or to get out of your comfort zone, or to create an honest connection with yourself. Avoid elaborating; pick one thing, and return to it as many times as you need to. Make it a mantra as you practice, as you do the dishes, as you drive home from work. When we invest our energy into a single-pointed focus, (this is also known as Dharana, the sixth limb of yoga), we discover how much we can love the work that we are given. Ande is a 500hr RYT with training in Vinyasa, Ashtanga, and SmartFLOW Yoga. Her emphasis in teaching is centered around a steady breath, which motivates controlled movement and cultivates a resilient mind. Her training in SmartFLOW Yoga invites mindfulness into her practice, and her love for the tradition of Ashtanga Yoga keeps her rooted in the breath. She believes that yoga should always be healing, but that doesn’t mean it will be effortless! She loves to explore the ways each student can be strengthened individually, yet ultimately give and receive support for each member of the community. Her teaching style is inspired by intelligent movement techniques and an intuitive alignment process (i.e. every body is different, and this creates a great opportunity for exploration and self-study). 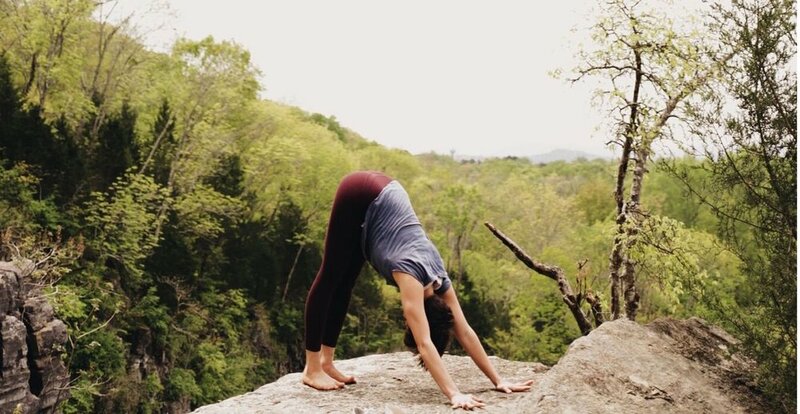 Ande recently moved to the Bay Area from Chattanooga, TN, where she was immersed in both yoga and climbing. She loves to (mindfully) challenge her comfort zone and encourage others to do the same! Her degree in Philosophy inspires a thoughtfulness in all areas of her life, aspiring to seek out truth, ask more questions, and help uncover the great potential that resides in every being.